Some of you have heard me tell my “camel story” when I realized I was oblivious about the world that God “so loves.” From my nice, middle-class neighborhood, God’s global concerns seemed far away. I was brooding one day over how the vertical blinds in my living room did not match exactly the paint on my wall. Had I mismatched the colors to begin with? Had the paint faded? The peaceful look of my home now seemed tarnished. As I pondered this, I sat down to read Global Prayer Digest. The story that day was about missionaries who break into locked apartments in Bombay and steal children out of them. Missionaries? These children have been captured by traders and sold to wealthy people. After they’re transported to another country, they’re then tied to the bellies of camels so that during camel races, the children’s screams make the camels run faster. Most of the children die, although some survive with deformities or brain damage. So these missionaries rescue these kids from locked Bombay apartments where they live among rats and cockroaches awaiting their sale. I collapsed on my sofa praying for these children and for the rescue workers who endanger their lives to do this work. Most GPD readings are not that heart-wrenching, but this one–like many others–pulled my thoughts away from my little world of me, myself and I. (p. 19 Growing Compassionate Kids). I began reading GPD in 1988 when I heard about a plan for making the gospel available to each person on the planet. The idea is that people are most likely to understand who Jesus is from another person who looks like them, speaks their language and was born in their culture. What does that mean for overseas missions? It offers a strategy: make an inroad into eachunreached group of people on the planet and let faith spread from within. Unreached people groups are those groups whose populations (which can range from hundreds to millions) contain less than 2% who follow Christ. Because this doesn’t sustain a movement to Christ, those who are part of an unreached people group have little to no opportunity to hear a presentation of the Gospel that is culturally intelligible to them. In this case, the gospel must be presented and lived out by people from outside their people group (missionaries). The folks from the US Center for World Mission who were sharing this then threw me my second big learning curve. Prayer for these groups really mattered. Their countless stories showed me that praying for these peoples and for those working with them was important. They believed this so much that they publish Global Prayer Digest, a small monthly booklet with background, statistics and stories (like the camel story), focused on a different people group each month. 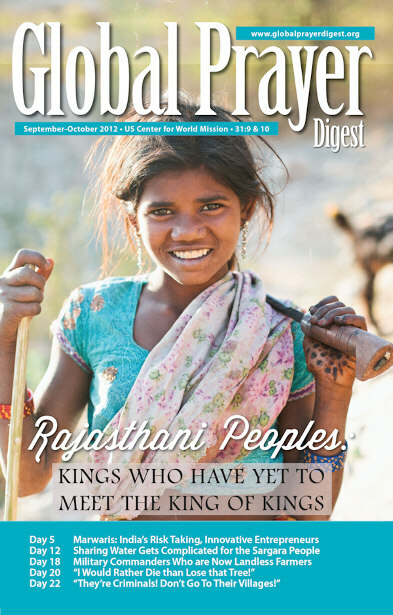 Global Prayer Digest has since given me the opportunity to pray for many unreached people groups around the world. Because this has been a huge part of my life, I’m sharing this with special thanks to my friend Keith Carey, editor of GPD. As you can tell from the camel story, I have benefited greatly. I see the world differently. I absorb news differently. When I wonder, What breaks my heart that breaks the heart of God? it isn’t about my vertical blinds!